I’ve just started on the Precious Gold Series so if there is an image you’d like me to create for you, let me know… like a fish or a tree or … commission work is always fun. 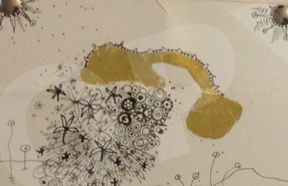 "Soul People" ©2014 Lovely Little Gold Leaf 6x6 pieces of art. Created on paper on wood panel and sealed for safety. Contact me for pricing. "A Day in a Life!" ©2014 Lovely Little Gold Leaf 6x6 pieces of art. Created on paper on wood panel and sealed for safety. Contact me for pricing. Note: I’ll be creating more of this and other sizes over time.